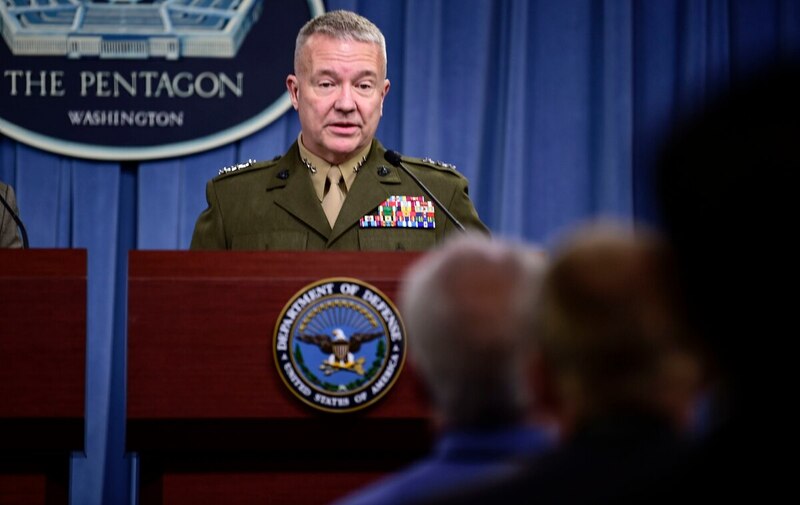 WASHINGTON — America’s withdrawal from the Iran nuclear deal earlier this year has not slowed Tehran down, according to the incoming commander of U.S. Central Command. At McKenzie’s Senate Armed Services Committee’s confirmation hearing, Sen. Elizabeth Warren, D-Mass., and a likely presidential contender in 2020, pushed back on President Donald Trump’s decision to abandon the Iran nuclear deal negotiated under his predecessor. “If Iran maintains itself in compliance, then I believe the president should reverse his reckless decision to withdraw from the nuclear deal and reimpose sanctions because the deal makes America safer and the world safer,” Warren said. During an exchange with Sen. Ted Cruz, R-Texas, McKenzie said U.S. withdrawal from the pact and its reimposition of sanctions continues to pressure Tehran’s economy, but acknowledged it may be able to circumvent sanctions by working with other nations. As Tehran aspires to develop an intercontinental ballistic missile, he said, the U.S. is watching its tests of space launch technology that could be transferred to “an ICBM of significant range.” If Iran were to become a nuclear power, not only would it threaten the U.S. but destabilize the region and “lead the worst of all possible outcomes for us, which would be proliferation across the theater,” he said. McKenzie acknowledged the National Defense Strategy’s emphasis on China and Russia — which forecasts reduced CENTCOM force structure — has impacted the frequency of U.S. aircraft carriers in the region. “It’s going to require the command to adopt innovative techniques to deter Iran because that’s the underpinning of everything else that will go on in the theater,” he said. If Iran were to challenge a U.S. naval vessel in the Strait of Hormuz, for example, it might take longer for the U.S. to respond, he said. The testimony came after the Senate advanced a resolution to withdraw U.S. military support for the Saudi-led coalition fighting a proxy war in Yemen with Iranian-backed Houthis. Support for the resolution has been fueled by outrage over Riyadh’s involvement in the death of journalist Jamal Khashoggi and the civilian death toll from the Saudi-led bombing campaign. Boeing clinched a $6.6 billion deal on top of a previous $6 billion contract for continued contractor support of the Ground-based Midcourse Defense System including providing 20 additional interceptors. Defense Secretary Jim Mattis and Secretary of State Mike Pompeo defended the U.S. relationship with Saudi Arabia at an all-Senate briefing last week on the war in Yemen and Khashoggi’s murder. In a rebuke to the Trump administration, a procedural vote afterward advanced the resolution, 63 to 37. America has a clear national interest fueling its involvement in Yemen, he said, and the humanitarian crisis there is “the child of Iranian ambitions” to make Yemen a client state. McKenzie also said he was confident ballistic missiles fired from Yemen at Riyadh are procured with Iranian assistance. Asked by Sen. Mike Rounds, R-S.D., about “the need to maintain a steady course” McKenzie also pointed to the threat from al-Qaida in the Arabian Peninsula, which aspires to attack the U.S., and the U.S. drive for a peace settlement. “I believe our ability to drive those discussions requires that we remain in contact with both U.A.E. and the Kingdom of Saudi Arabia,” he said. In Warren’s exchange with him, McKenzie confirmed the U.S. provides arms to the coalition, until Nov. 11 refueled its aircraft and provides intelligence, but not for targeting. Warren called for a reevaluation of U.S.-Saudi relations. Sen. Tim Kaine, D-Va., suggested to McKenzie the administration’s legalistic argument against the pending war powers resolution — that those activities don’t constitute “hostilities” under the law — is undermining the credibility of defense officials on Capitol Hill.